Workers in the oil and gas, construction, manufacturing, mining, agriculture, transportation, and many other industries may use diesel to power vehicles and equipment. The Occupational Safety and Health Administration (OSHA) stresses the need to properly control diesel exhaust because of health issues that can be caused by exposure to the dangerous mixture of gases and small particles found in the exhaust. Engineering controls, administrative controls, and personal protective equipment (PPE) can help reduce illness in workers exposed to diesel exhaust. Diesel particulate matter (DPM) is a component of diesel exhaust (DE) that contains soot particles made up of ash, carbon, metallic abrasion particles, sulfates, and silicates. Short-term exposure to high concentrations of DPM can result in dizziness, headaches, and irritation of the eyes, nose, and throat. Lengthy exposure can increase a worker’s chance of developing lung cancer and cardiovascular, cardiopulmonary, and respiratory diseases. Personal protective equipment may also help to reduce health issues when worker exposure reaches certain levels. For example, the Mine Safety and Health Administration (MSHA) requires miners to wear respiratory protection when engineering and administrative controls do not reduce a worker's exposure to an acceptable level. Protect crews that work with diesel-powered equipment. 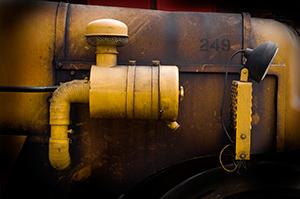 Train workers to understand hazards, implement effective controls, and provide respirators to reduce the risk of illness that can be caused by exposure to diesel exhaust.